Feifei Sun first trained as an architect and then started her environmental role in 2004. After completing her Masters in Energy & Environment at AA school, She worked for the Ministry of Construction, P.R. China and international companies. She has been sponsored to undertake further research work focusing on Chinese residential sustainability. 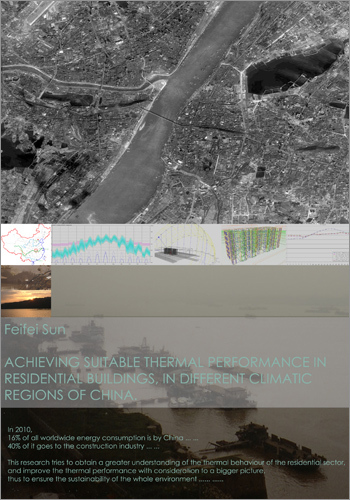 The purpose of this research was to identify new technologies and applications of existing practices that can significantly improve energy efficiency and indoor thermal comfort of new residential buildings in China. The study investigated and presents this potential for each of the country’s five climatic regions. PhD awarded 2012.